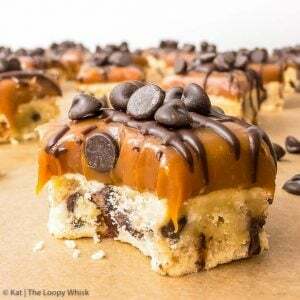 These super decadent and incredibly delicious salted caramel chocolate chip cookie bars are extremely easy to make. Crumbly, buttery chocolate chip cookie dough is paired perfectly with luscious salted caramel, and the extra melted chocolate and chocolate chips round off what just might be your new favourite dessert. Yes, do read the post title again. Salted caramel. Chocolate chip. Cookie bars. Aren’t you glad you’ve stopped by?! There are quite a few words that come to mind regarding this recipe. Okay, the last is not really a word (if you squint, it is), but it’s exactly what these lovelies are. Because why stop at just cookie bars? Let’s also add in chocolate chips. A whole lot of them. And let’s go a step further and slather on a thick layer of shiny, luscious salted caramel. Then, a drizzle of melted chocolate. Just because. And more chocolate chips. And… no, wait, that’s it. There is nothing understated or subtle about these salted caramel chocolate chips cookie bars. They are layer on layer of deliciousness; each layer oh-so-yummy on its own, but together… they will. Blow. Your. Mind. The just-crumbly-enough cookie bottom is perfectly buttery, and contains enough chocolate chips for every mouthful to be a mini chocolate taste explosion. The cookie dough itself is only slightly sweet, and is balanced perfectly by the luxurious salted caramel layer. Getting the salted caramel to set to just the right consistency is a delicate science – and this recipe gets it right every single time. The caramel is thick enough to be able to cut the bars easily, but melts the moment it hits your tongue. The melted chocolate and extra chocolate chips complete a dessert that is virtually impossible to improve further. 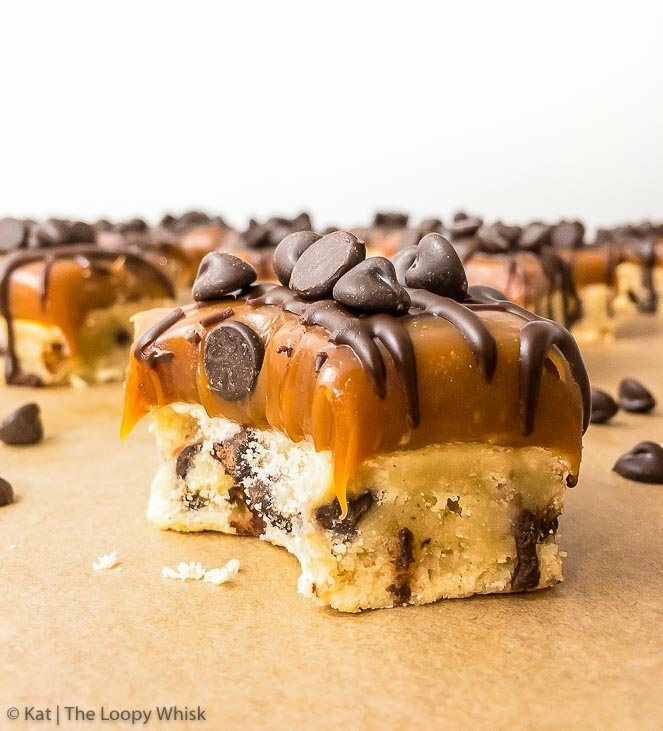 Here’s another amazing thing about these salted caramel chocolate chip cookie bars: they are incredibly easy to make! Yes, really. I bet you’re frowning sceptically at the screen right now, thinking I’m having you on. I’m not, pinky promise. 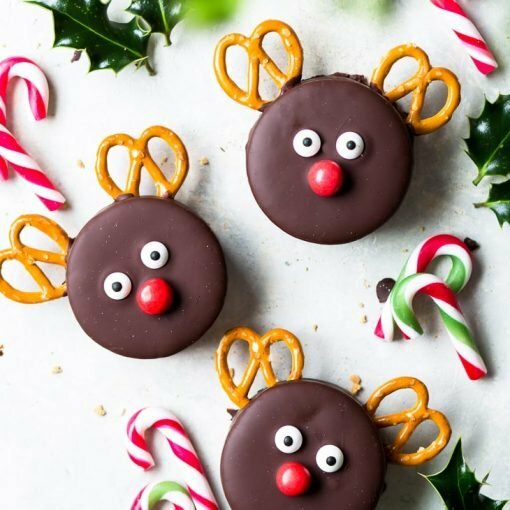 And when you make them, and everyone’s ‘oohing and aahing’ over them, and asking you how long you’ve slaved away in the kitchen to make this masterpiece… well, then, you’ll believe me. And the wonders of these salted caramel chocolate chip cookie bars don’t end here. 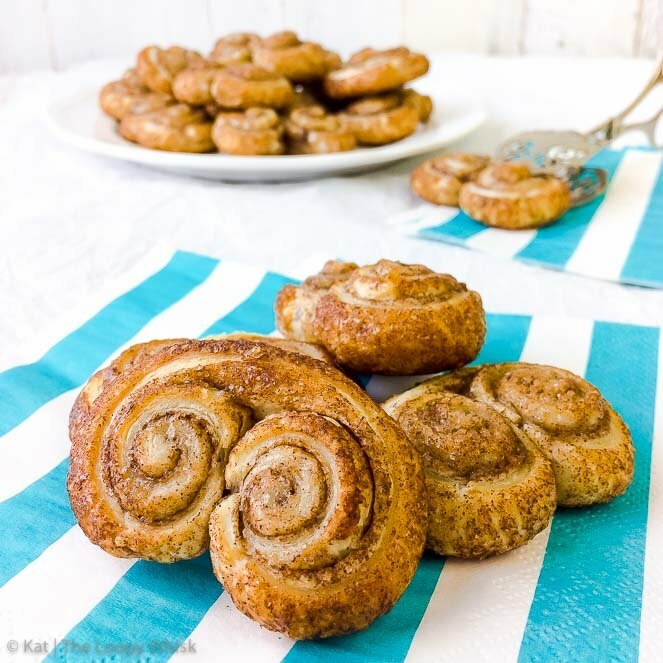 In addition to being super decadent, incredibly delicious, and extremely easy to make, they are also ideal to make for a large group of people. The only limit is the size of your baking tray – other than that, go crazy. Do these salted caramel chocolate chip cookie bars seem too good to be true? Yes. But are they? Most definitely not. However, as they say, “the proof is in the pudding”. So make them. Enjoy them. Share them. And then make them again. Because once you’ve tasted them, you’ll want to do so again. And again. These super decadent and incredibly delicious cookie bars are extremely easy to make. Crumbly, buttery chocolate chip cookie dough is paired perfectly with luscious salted caramel, and the extra melted chocolate and chocolate chips round off what just might be your next favourite dessert. NOTE: In making these cookie bars, I have used a 8.5 x 7.5 " baking tray 2 inches deep. For baking trays of different dimensions, the ingredients amounts, and possibly the baking time, need to be adjusted. Add the egg, and mix thoroughly. Add the flour, salt and chocolate chips, and mix until a smooth, not sticky, cookie dough with evenly distributed chocolate chips forms. Press the cookie dough into the lined baking tray and even it out so that it is approximately 1/2 inch (about 1.5 cm) thick. Put into the fridge for about 1/2 hour. Bake the cookie dough in the preheated oven at 350 ºF (175 ºC) for 18 to 20 minutes, or until light golden brown at the edges. The cookie dough might feel soft immediately out of the oven, but will firm on cooling. Leave to cool completely (in the baking tray!). In the mean time, make the salted caramel. Heat caster sugar in a saucepan over medium heat, stirring constantly with a heat resistant rubber spatula or wooden spoon. The sugar may form clumps but will eventually melt into a thick golden brown liquid as you continue to stir. Be careful not to burn the caramel. Once the sugar is completely melted, immediately add the butter. On its addition, the caramel will bubble rapidly – be careful. Stir the butter into the caramel until it is completely melted, about 2-3 minutes. The butter will tend to separate from the caramel – just stir vigorously. Very slowly, drizzle in the double cream while stirring. The mixture will rapidly bubble due to the temperature difference and may splatter – be careful. Allow the mixture to boil for about 1 minute. It will rise in the pan as it boils. Remove from heat and stir in the salt. Allow to cool down before using (the salted caramel should be slightly warmer than room temperature for pouring onto the cookie bottom). Any leftover salted caramel sauce (what's that?) keeps well in the fridge for up to 2 weeks. Still in the baking tray, pour the warm salted caramel onto the cookie bottom so that it forms a uniform layer, about 1/2 inch (1.5 cm) thick. Allow to set overnight in the fridge. The salted caramel will firm up, enough to be easy to cut but retain its melt-in-the-mouth consistency. 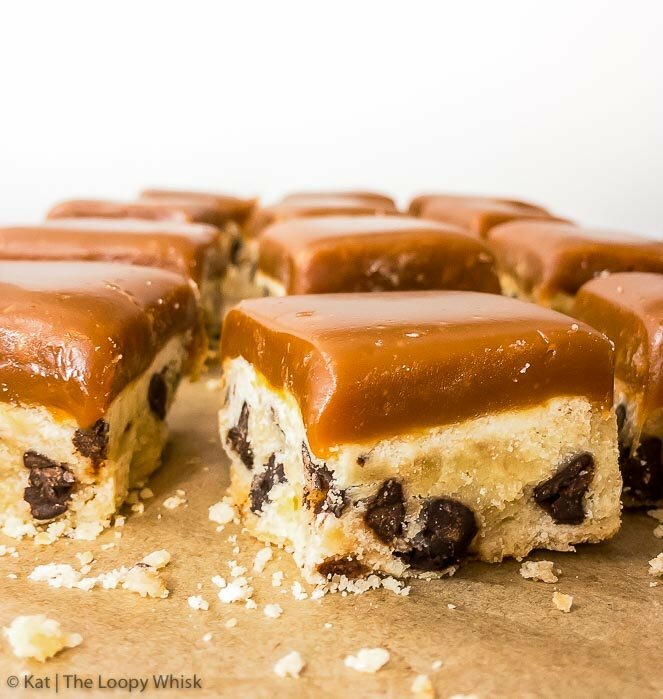 Remove the cookie bottom + salted caramel layers from the baking tray, and while still cold, cut them into rectangular pieces (the recipe should give about 20 pieces). Drizzle the cookie bars with melted chocolate, and decorate with extra chocolate chips. And enjoy! The salted caramel chocolate chip cookie bars keep well in a cool dry place (or even in the fridge, just allow them to come to room temperature before serving) for about 3 to 4 days. They never last that long, though. Note 1: The exact amount of salt depends entirely on how salty you want your salted caramel to be. I advise adding the salt gradually – you can always add more, but cannot take it away! Looking for more salted caramel deliciousness? I have just the thing! 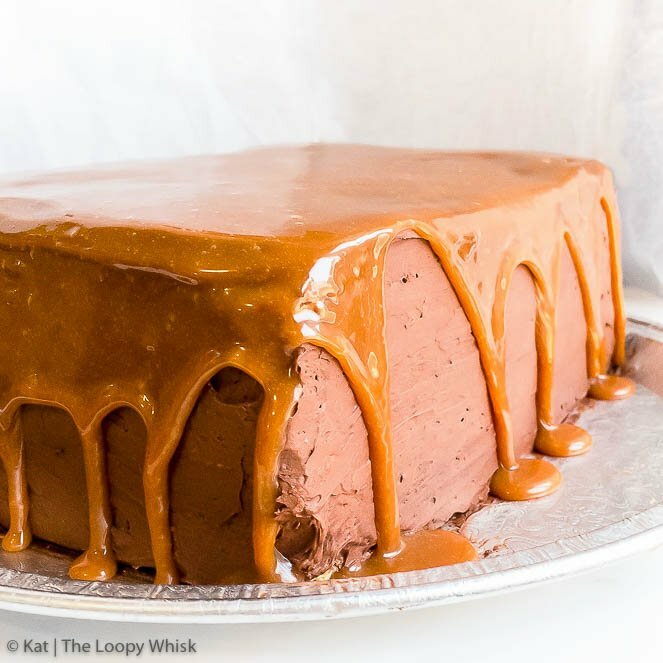 Chocolate Peanut Butter Cake with Salted Caramel! Wow! 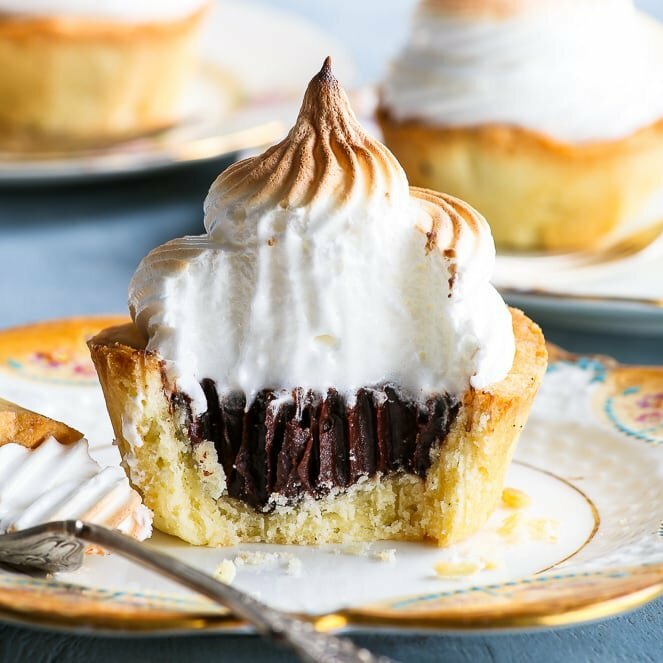 These look incredibly decadent! Thank you Vicki! And they really are decadent, but definitely not too rich (meaning: one piece is never enough 😉 ). Oh gosh, I can hear these bars calling my name! Everything about them look absolutely irresistible. 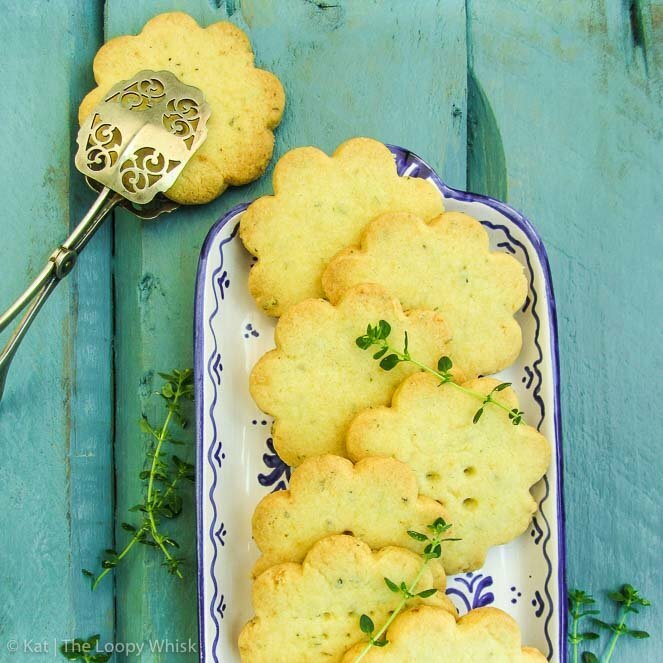 Stopping by from #recipeoftheweek! That being said, here are the measurements: For cookie base – 3/4 cups butter, 1/3 cup caster sugar, 1 large egg, 2 1/2 cups plain flour, pinch of salt, 1/3 cup chocolate chips. For salted caramel – 1 2/3 cups caster sugar, 1/3 cup + 2 tbsp butter, 3/4 cups + 2 tbsp double cream, 1-2 tsp salt. Thank you so much for the conversions!! I still need to invest in a scale and I was just about to attempt conversions myself, but my 2 little boys are getting very Impatient and just want to start baking! These bars look so delicious! Hi Mara, I know exactly what you mean! 😀 I’m originally Slovenian and the cups/tablespoons were initially always a pain, especially when you REALLY want to make a recipe. This website is brilliant for conversions: https://www.weekendbakery.com/cooking-conversions/ It takes a bit of time to convert, but if a recipe is super yummy… it’s worth it 😉 Hope you like the cookie bars! Thank you for using grams! I was expecting cups as is usual with most delicious looking baking recipes and was delighted to see something I understand! I’m a UK baker and it’s taken me ages to translate American recipes, I finally figured out 1 cup is 8oz (and devides accordinly), 1 table spoon 0.5 oz but that was as close as I got! Thanks again for this lovely recipe, can’t wait to try it out! Hope the cookie bars turn out well! I have a question about the double cream. Is that whipping cream? Or do I need to look for double cream? Going to try this but am very scared doing it with grams. Don’t want to convert because this looks amazing and I always bake it according to the recipe the first time then make it my own after that. Hi Wendy! As far as I am aware, double cream has a higher fat percentage. So if you’re in the UK, definitely look for double cream (I believe it’s called “heavy cream” in the US). Whipping cream gives a runnier caramel, that’s still yummy but doesn’t set well, and things can get… messy 😉 For this recipe, I really recommend using grams (at least initially) – the textures and consistencies are key (the cookie bottom just crumbly enough and the caramel layer sticky but not runny) and I’m not sure if you can be as precise using cups/tablespoons. Hope it turns out well! Just to clarify. Cream that has 35% milk fat is called heavy cream in the US but is called whipping cream in Canada. It is the same thing. Wendy may be a Canadian baker. Hej! I tried these yesterday, and they are really yummy. But I wonder if the caramelpart is correct? I had to boil of for a lot longer, and it still turned out really runny. I have compared with other recepies, and it seems to be more cream than in those? Hi Ida, glad you liked them! I actually made this recipe again just a few days ago, and caramel set really nicely. 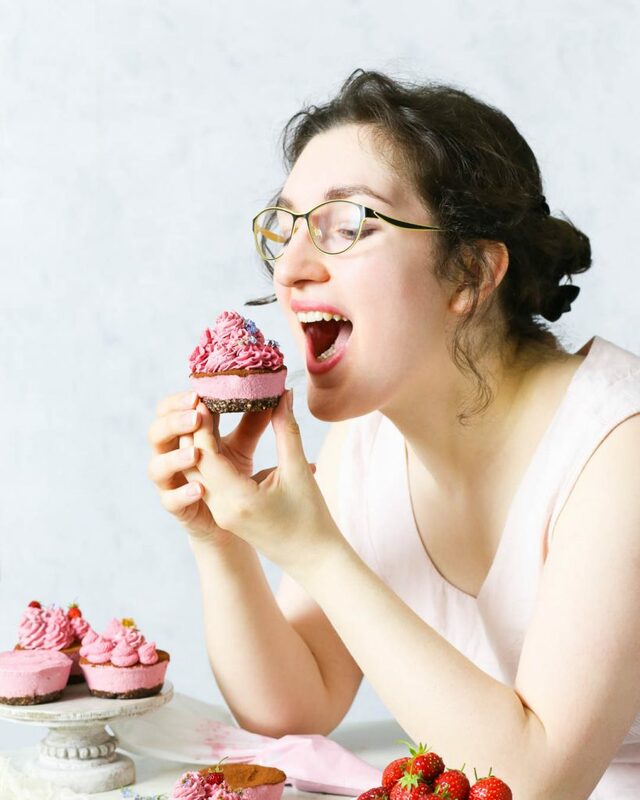 There IS more cream in my recipe than in others – because when I initially followed those recipes, the caramel on cooling turned into a semi-solid ball that could break teeth when totally cooled. – not allowing the caramel to set in the fridge for a few hours (the caramel should set into a sticky layer that should be able to be cut and isn’t runny). I hope any of this helps… I know people have been successful in making these (and LOVED them) – hope you give them another go! And I’ve just thought of another thing – if you’re in the US and used “heavy” cream instead of “double” cream, this could be a reason for a runnier caramel. Heavy cream has approximately 36% milk fat, whereas double cream has about 48% milk fat. So if you use heavy cream, use about 10-15% less. Please convert measurements I have a chart to convert but nothing matched. This sounds fabulous would love to make it. 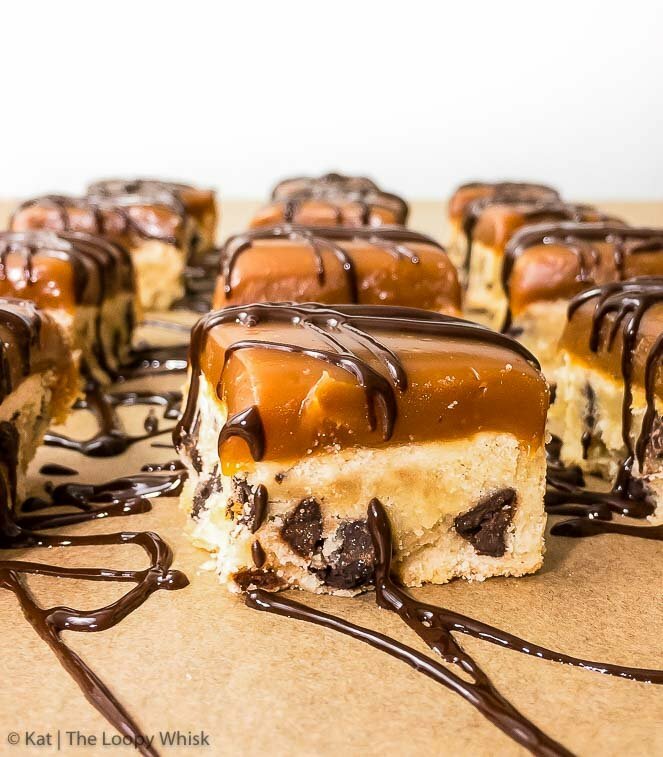 Salted Caramel Chocolate Cookie Bars. Thank you. For cookie base – 3/4 cups butter, 1/3 cup caster sugar, 1 large egg, 2 1/2 cups plain flour, pinch of salt, 1/3 cup chocolate chips. For salted caramel – 1 2/3 cups caster sugar, 1/3 cup + 2 tbsp butter, 3/4 cups + 2 tbsp double cream, 1-2 tsp salt. (For salt, add gradually – you can always add more, but can’t take it away). 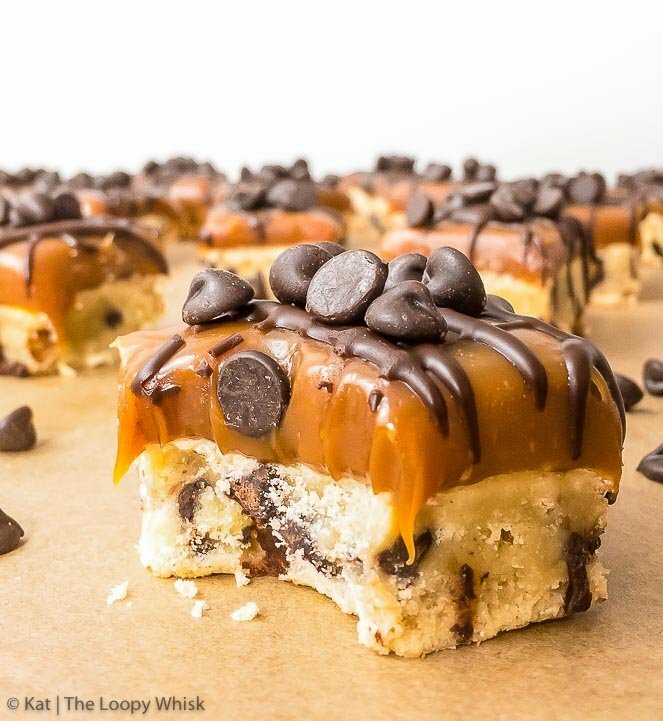 This caramel chocolate chip cookie bar looks amazing, a great dessert for everyone, Thank you for sharing this recipe, amazing work.